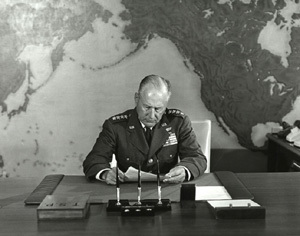 A recently declassified Joint Chiefs of Staff report on “Berlin Contingency Planning,” produced in June 1961 as the Berlin Crisis was heating up, includes horrific estimates of fatalities and destruction that the execution of U.S. war plans would cause to the Soviet Union and putative allies. According to the JCS, if the full U.S. nuclear force assigned to the Single Integrated Operational Plan (SIOP) struck the Soviet Union, 54 percent of the total population would be killed, that is some 108 million of a total population of 217 million. If the smaller alert force (bombers on 15 minute to 2 hour alert) was used, total Soviet casualties would be 37 percent or about 80 million. Against China, the full force would kill a smaller proportion because there were fewer cities: 16 percent of an estimated 650 million or about 104 million. Poland, the site of Soviet air defense installations, would suffer 2,636,000 million casualties in an attack by the full force. The report, sent to Secretary of Defense Robert McNamara, was for National Security Adviser McGeorge Bundy to use for answering questions posed by White House adviser and former Secretary of State Dean Acheson. Total USSR casualties destroyed by US nuclear strike: 54 percent of total population. The estimated fatalities would be caused by the implementation of the first SIOP (for fiscal year 1962), which the Defense Department had created to consolidate Air Force, Navy, and Army nuclear war plans and to eliminate duplicate targets, among other problems. The terrible casualty figures were the direct consequence of standard operating procedures used by war planners. According to the JCS report, the SIOP-62 stipulated a 95 percent assurance factor for the destruction of targets “representing a direct threat” to the continental U.S. A very high assurance of destruction in Russia was considered to be essential to minimize the danger posed by Soviet forces to the continental United States. To meet the assurance criteria SIOP-62 posited a mass attack of an alert force of over 1700 nuclear weapons. Some Designated Ground Zeroes (DGZs) would be struck by 2 or more weapons, creating more devastating weapons effects (fires, blast, and radiation). The high degree of assurance is one of the bases of the “overkill” that was associated with U.S. nuclear war plans. The JCS report includes never before declassified details on major target categories that comprised the SIOP target list. 983 “nuclear threat” targets (bombers, missiles, nuclear storage), targets threatening “forward areas” (U.S. bases and allies in Western Europe, East Asia), “satellite air threat” (airfields and air to surface [possibly surface to air] missile storage), and “residual air and surface capability” (reserve airfields, air depots, etc.). According to the report not all of the 983 “installations” were targets for the alert force. For example, 230 airfields were reserved for attack by the full force only. The JCS provided the details on nuclear threat targets in order to answer fully one of Acheson’s questions. To the query on how much of the Soviet Union’s strategic attack forces would be destroyed, the Joint Chiefs of Staff’s response was hardly encouraging: an estimated 42 percent of the total would suffer “severe damage” if the United States launched a preemptive attack. This left the Soviet Union with considerable retaliatory strength to impose massive destruction on the U.S. and allies. This document gives us only a partial view of SIOP targeting. Not mentioned air defense targets which numbered 41, according to a message from Navy planners in Omaha. . The SIOP also covered Bravo or non-nuclear military targets. The same Navy document describes a merging of Alpha and Bravo target lists by the Joint Strategic Target Planning Staff, while the history of SIOP-62 depicts a process of “optimum targeting” involving an “optimum-mix” list of the “best combination” of military and urban-industrial targets. 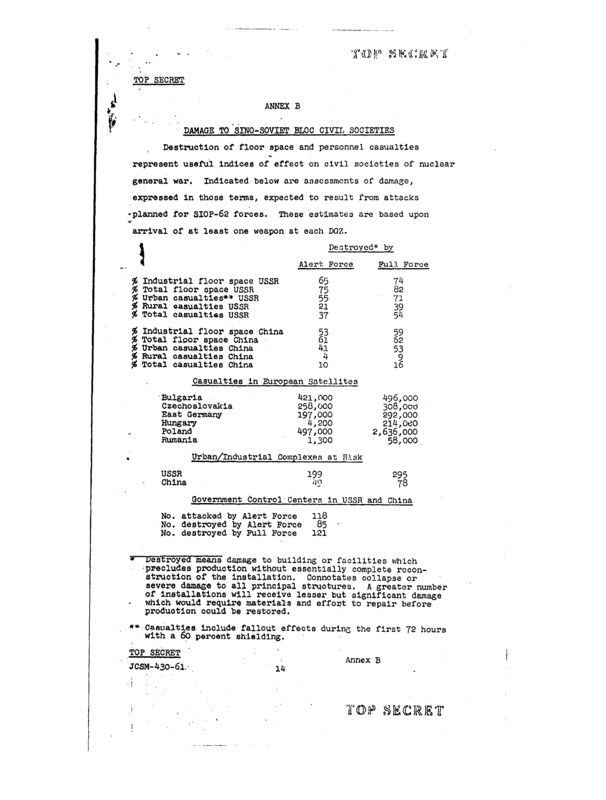 Exactly what the “optimum mix” looked like is classified, but according to the Navy message, by late April 1961 the melding of Alpha and Bravo target categories for the alert force had produced a list of 725 DGZs including 41 air defense targets (20 of which were defenses of strategic nuclear targets). The 725 targets would be struck by 1706 weapons. What made this extraordinary JCS report available was a joint effort by the National Declassification Center at the National Archives and the CIA’s Historical Publications Office to declassify several hundred documents on the Berlin Crisis during the Eisenhower-Kennedy-Khrushchev years. The documents were released in conjunction with a conference on 27 October 2011, to commemorate the 50th anniversary of the Checkpoint Charlie tank confrontation, one of the major events of the 1961 crisis. The NDC and the CIA deserve a lot of credit for spearheading this effort and coordinating declassification of highly significant documents on a wide range of issues, including intelligence assessments, material obtained from clandestine sources, covert action planning, negotiating strategy, and politico-military contingency planning. Many of the documents have never been declassified or published before and researchers will find much of value. .. For SIOP-62 see David A. Rosenberg, “The Origins of Overkill: Nuclear Weapons and American Strategy, 1945-1960,” International Security 7 (1983): especially 7-8 and 64-68. Rosenberg’s evidence suggests that the JSTPS sought assurances of as high as 97 percent to destroy the first 200 DGZs.
 . Rosenberg, “The Origins of Overkill,” 6.
 . The CIA’s briefing package states that this is the “first time” publication of the State Department six-part history, Crisis Over Berlin, but it was declassified (except for a few lines in Part VI) by the Department in the early 1990s in response to a FOIA request. The National Security Archive subsequently published this history in William Burr, ed., The Berlin Crisis, 1958-1962 (1993) also available on the Digital National Security Archive. If you are planning a weapon lay down it is normal planning to apply multiple weapons against a high value TIDGZs to get a probably of 1 to achieve an assured destruction capability. You are talking about 1961 prior to Minuteman your missiles are Atlas and Titan I and aircraft delivery B-52s mostly D models. B-52 had an alert rate of about 40 – 45%, Atlas and Titan I, the alert rate of well under 50%. A great deal of cross targeting between weapon systems and weapon locations was necessary to achieve assured destruction capability of a given high value target island. When the Soviets installed their ABM system around Moscow, the radar and computer system could process a given number of weapons inbound per minute to get an insured destruction capability it was necessary to overpower the weapon system with a weapon delivery rate greater than their capability to process for several minutes. The Soviet SA-5 surface to Air Missile system was ties into the Dog House and Hen House radar systems giving the Soviets a wide area ABM System that was never covered in any Strategic Arms Agreements. In any subsequent SIOP planning this defensive capability had to be over whelmed first in any missile planning scenario by JSTPS. There is and never was such a thing as Over Kill, it is a stupid term used by ignorant people with little conception of nuclear war planning. At the time, overkill was an accepted term for how SAC had programmed its force to have the correct Pk or kill ratio on a target. Setting this at 97% or better meant that it would have dropped more than one device on each target. This targeting was revised by Kennedy after the Cuban Missile Crisis. Even General LeMay discussed having the USSR reduced to dust rather than just rubble. This force reduction was the reason we had roughly 1000 ICBMs during the Cold War rather than the higher numbers that SAC wanted. At this time there were also B-47s still in the inventory, B-58s as well as B-52s. There was an assumption forces would be staged from forward deployed forces. If not, there were differences which were shown as to what targets would be hit depending on how much lead time SAC had to surge the force. Tankers at this time were primarily the KC-97 which also would limit targeting. Targeting evolved further throughout the decades to more refined options when I was working on the B-1 nuclear systems. Weapons became more accurate and more reliable. By the 1980s the number of types of nuclear weapons had been reduced significantly, most early devices had been retired, the B-1 carried two types, the B-52 a few more. Nuclear weapon surety also had improved over the years. By the 1990s only the USAF and the US Navy had nuclear capabilities. Navy surface ships had lost their capability as had the Army, both of whom would have figured into the 1961 reports. As noted, a lot of this duplication lead to the SIOP being created by a joint planning staff. What about US casualties?Believe me in 2015,any nuclear attack on China will require a PLA response and though not on the scale of a US attack,is enough to give pause to any US president. The best option is not to use nw . The problem is the US is a superpower and thinks it is god of war, It can use nw but others must not. If China/Russia has nw,they must be neutralized .